The sun was set to bake and the air swamped with humidity. Our upper bodies listed forward beneath the weight of 40-pound packs. With every muscle in our legs, back, and shoulders begging for mercy, one of us had the audacity to ask if we were there yet. It was our first day on “the trail” and we were nearing the West Peak of Goose Eye Mountain, the second of four 3,500-plus foot summits on the day’s docket, when we encountered a squat, bulldog of a man and his two teenage sons descending a steep rock face. “Isn’t there any place in Maine that’s flat?” the man said in lieu of a greeting. Truth be told, neither was I. 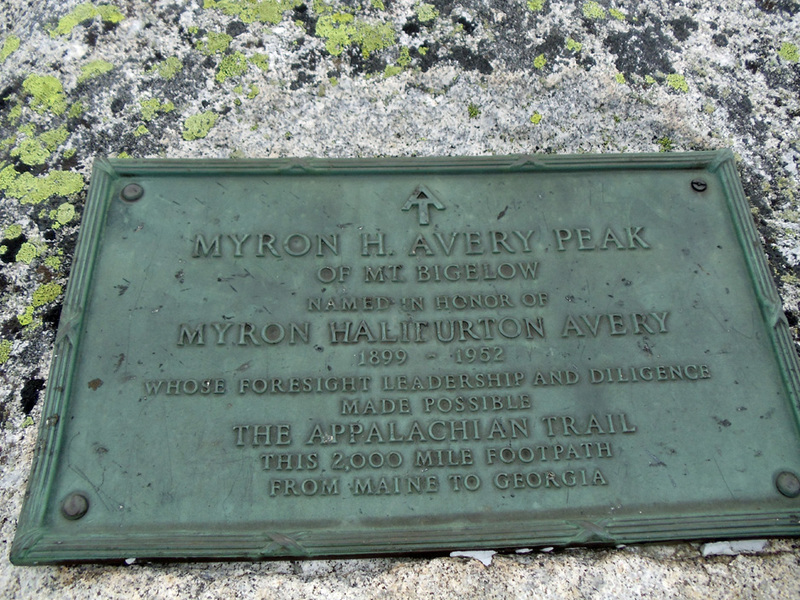 The Maine Appalachian Trail (MAT) is officially listed at 281.4 miles, though recent relocations have likely added steps. 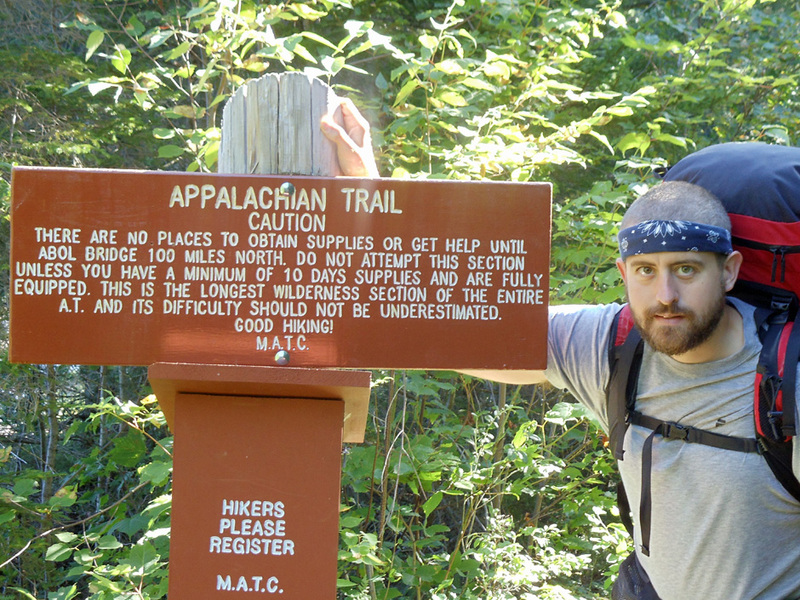 Even so, it’s a far cry from being the longest of the 14 Appalachian Trail states. Maine accounts for only 13 percent of the entire 2,178.3-mile trail, well short of Virginia’s 25 percent. Nor does Maine boast the highest peak—that honor belongs to 6,642-foot Clingmans Dome in the Great Smoky Mountains of Tennessee and North Carolina. Statistics, however, are for maps. Ask anyone who has completed the entire trail and they’ll likely tell you Maine is the toughest state. Maine’s reputation is primarily earned in its Southwestern region, a 113-mile stretch that plays out like a topographical game of connect the dots. Each day is a new mountain, or two or three, highlighted by the imposing climbs of Old Speck, Baldpate, Saddleback, and Bigelow. All told, there are seven 4,000-plus foot peaks and 13 others topping 3,000 feet with significant elevation gain and loss between each. 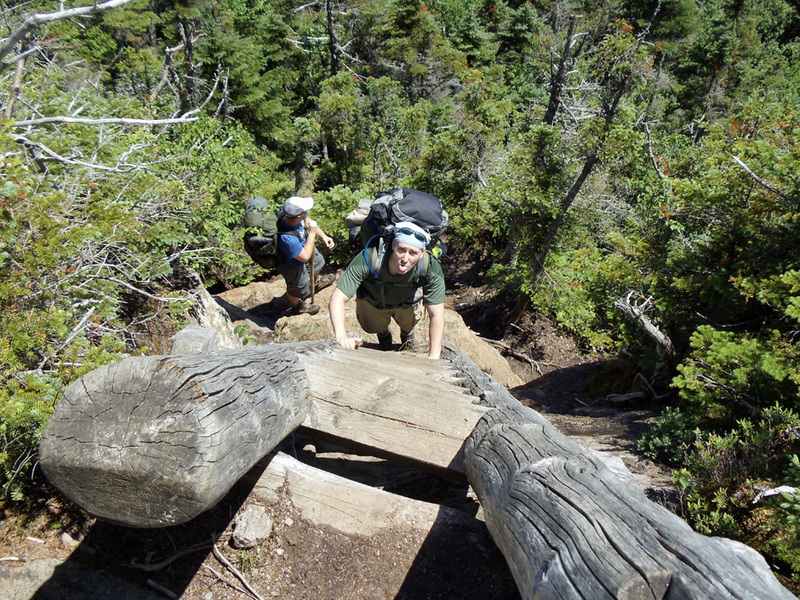 Most people who section hike Maine start at Katahdin and venture south to earn their trail legs before reaching this grueling stretch. Not us. For reasons that made sense at the time but were quickly dissolved of rationality, my brother Brad and I decided to put our soft-padded feet directly into the blistering fire. As Maine natives who grew up on a healthy diet of hiking, hunting, and fishing, we thought we knew what we were getting ourselves into. 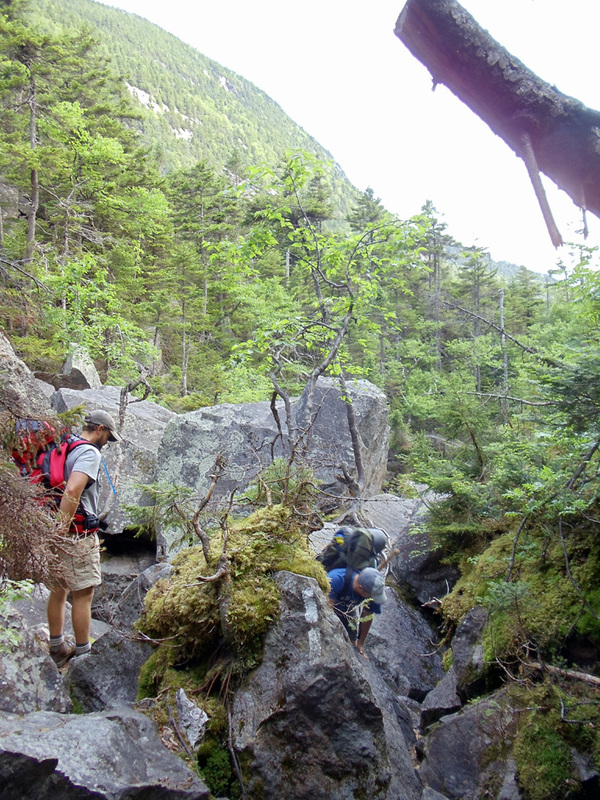 In Mahoosuc Notch, the “trail” is often open to interpretation. Day two included Mahoosuc Notch, a boulder-filled gorge widely regarded as the hardest mile on the entire Appalachian Trail. Cold air rose beneath our feet and lapped our faces as we dropped into the gorge. We had to remind ourselves that it was the Fourth of July at the sight of winter preserved beneath the giant rocks. Naturally, we did what you might expect from brothers. We had a snowball fight. The trail, a loosely defined term in Mahoosuc Notch, led us scrambling over, around, and even under boulders as massive as dump trucks. In one spot we had to remove our packs in order to squeeze through a narrow cave. Such obstacles make the notch more technically challenging than physically demanding. All told it took us nearly two hours for this one mile, but as fun and memorable as it was, my vote for the MAT’s most difficult segment is cast for what came next. Upon exiting the notch we immediately found ourselves climbing the Mahoosuc Arm of Old Speck Mountain, a mile and a half stretch with over 1,500 feet of elevation gain. Here, the trail goes straight up a cascade of rock embankments that will test the mettle of the most agile through hikers. Unlike many of the rock faces we encountered on Goose Eye Mountain where hikers are often assisted by metal rungs or wooden ladders, we were left to our own devices and the tools provided by Mother Nature. “This wasn’t in the brochure,” Brad said, instantly coining our trail slogan. Our third night found us at the Frye Notch Lean-To. Located on a slope within the notch, the campsite was already sheltered from sunlight by mid afternoon, giving it a dark and gloomy appearance. “Do you get the feeling this shelter is haunted?” I asked. The Frye Notch Shelter: beware of moose. We agreed to stay in the lean-to instead of setting up our tent. This somehow seemed safer. Shortly after nightfall there was a crashing sound on the ridge above us. It wasn’t unusual for hikers to arrive after dark so we listened carefully, hoping to hear voices or the unmistakable clanking of trekking poles. Instead, we were treated to more crackling of sticks moving ever closer. A shrill bleating grunt jolted us upright. “Or a witch,” Brad replied. The moose continued to haunt us for the better part of the night. When it was taking a break, the shelter’s resident mice put on an intermission show of hide and seek. Each time one of the pesky rodents scampered across our sleeping bags, my shoulder, and even Brad’s head, we reached for our flashlights with murderous intent. Then, just as my eyelids started to surrender, bullets of water from a passing shower rang like rocks off the lean-to’s tin roof. Wait, which mountain are we on? After our night in Frye Notch, I was constantly surprised by the amount of people, men and women alike of varying ages, who solo hike the Appalachian Trail. Looking back on it now, only once were we in a dangerous situation. It was getting late in the day when our ascent of Saddleback Junior was hastened by ominous clouds and the unwelcomed sound of thunder. We made it over the summit but the storm overtook us before we could reach the next campsite, forcing us to get low and wait it out. It was still raining when we reached the Poplar Ridge Campsite. The lean-to was already full and the lower-ground tent sites were also taken, giving us no choice but to camp near the top of the ridge. We set up as quick as we could and dove into the tent. Dinner was a granola bar and beef jerky. The real hair-raiser came later that evening when another thunderstorm passed overhead. Rain pounding the ground ricocheted under the tent fly, gusting winds made us question the sturdiness of the tree branches looming above, and lightning snapped so close we could hear the electricity crackling. It didn’t take an overactive imagination to realize being in a nylon structure held erect by metal poles at 3,000 feet was less than ideal. “I’m pretty sure this wasn’t in the brochure,” I said. The next morning we awoke wet, sleep-deprived, and ornery. For the first time in a week of being on the trail we felt truly defeated. But then a funny thing happened. The sun came out to dry our clothes and warm our spirits. By lunch we were laughing about the whole ordeal. The summit of Saddleback Mountain, pre thunderstorm. And so it goes on the trail. It no longer seemed strange that people would set out alone, content to forge friendships on the way. Commiserating with others the morning after the storm, there was a prevailing sense that we were all in this together, part of a greater roaming community. Perhaps this attitude is born out of the trail itself. 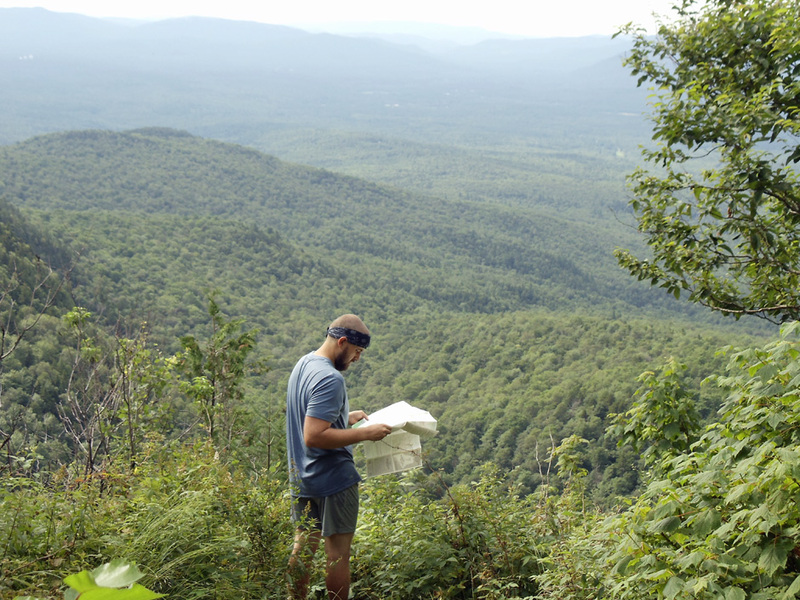 The MAT’s mere existence is a labor of love, mostly cared for by the Maine Appalachian Trail Club, a nonprofit organization comprised of volunteers who give their time and sweat to the trail’s betterment. The MAT experience isn’t complete without a few off-trail respites to indulge in such luxuries as a shower, bed, and the biggest, juiciest burger with fries imaginable. After prolonged stretches of eating squirrel food and filtering water from glorified mosquito puddles, treats like these are nothing short of magic. Trail towns such as Andover, Rangeley, Stratton, and The Forks all offer such amenities, but the one must-stop is Monson, home to the legendary Shaw’s hostel. There’s a sign on the door at Shaw’s informing hikers that if no one is there to come on in, choose a bed, and take a shower. Dawn, one of the co-proprietors, was more than happy to pick us up trailside (where she met us with refreshments) and even drive us to Greenville for a nominal fee so we could resupply. Add to the hospitality a hearty all-you-can-eat breakfast and Shaw’s is a trail mother’s dream come true. We thought the 100-Mile-Wilderness would be easy. This wasn’t in the brochure. The northern end of the MAT is anchored by the 100-Mile Wilderness, revered for being such a long stretch of untamed forest with no designated resupply points. In some respects the wilderness is a tad overrated, a victim of its own popularity. We saw more people during this stretch than the rest of the MAT altogether. The trail also crosses several well-traveled logging roads that make resupply possible. On the other hand, many areas of the wilderness such as the red pine grove around Lower Jo-Mary Lake are truly enchanting and fully worth the hype. 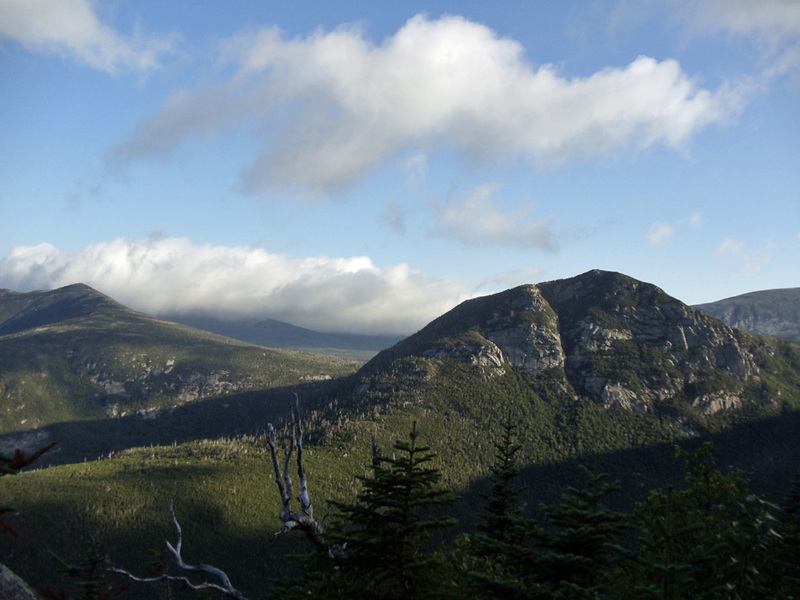 The 100-Mile Wilderness ends on the doorstep of Baxter State Park and Katahdin, the northern terminus of the Appalachian Trail. Once known to Native Americans as “Kette-Adene,” or “The Greatest Mountain,” Katahdin is the perfect conclusion to the MAT. The first two miles begin with a gradual ascent through dense forest that speaks of the 100-Mile Wilderness. Next up is Katahdin Stream Falls, a tranquil reminder of the waterfalls in Dunn Notch and Gulf Hagas. The trail then becomes relentlessly steep climbing stone staircases that could be mistaken for those of White Cap Mountain. Katahdin’s tree line transported us back to Mahoosuc Notch with a boulder field every bit as challenging. Scrambling over the massive rocks with a fierce wind tugging at our clothes, we had the distinct feeling that one slip could send us spiraling off the face of the Earth. All trail nostalgia ended at the “Gateway,” entry point to Katahdin’s mystical tableland. The wind granted us a brief reprieve as we were suddenly enshrouded in a passing cloud, seemingly entering the great unknown. There were numerous signs asking hikers to respect the rare and fragile alpine vegetation, and if there was any doubt, the trickling Thoreau spring was a gentle reminder that we were upon a special place in the heart of Maine. 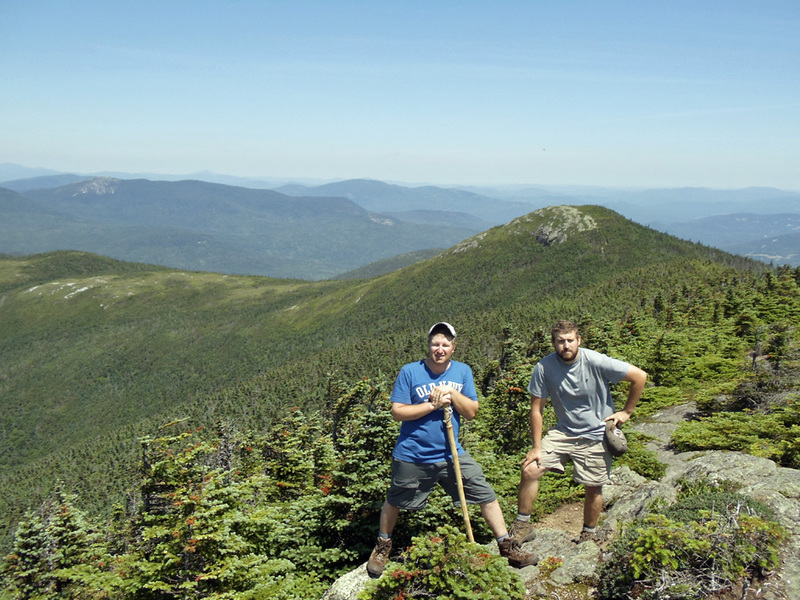 Before we knew it we were once again in the clear and posing for pictures atop Baxter Peak, elevation 5,267 feet. Champagne was popped and high-five congratulations were shared amongst those we’d met along the way. For us it was the culmination of a truly extraordinary adventure. 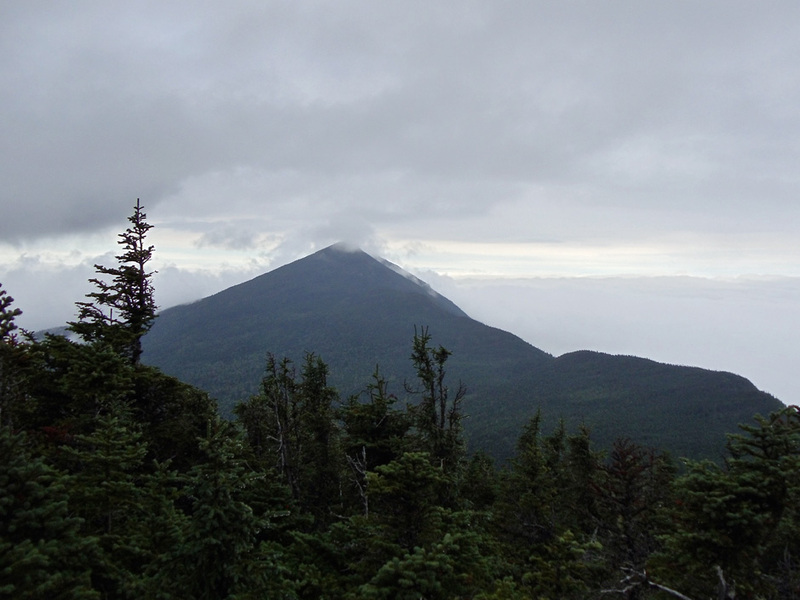 Our celebration was given pause, though, by the dramatic view of the jagged Knife Edge, an additional challenge offered by Katahdin for the brave and fool hearty. For the record, we were neither. 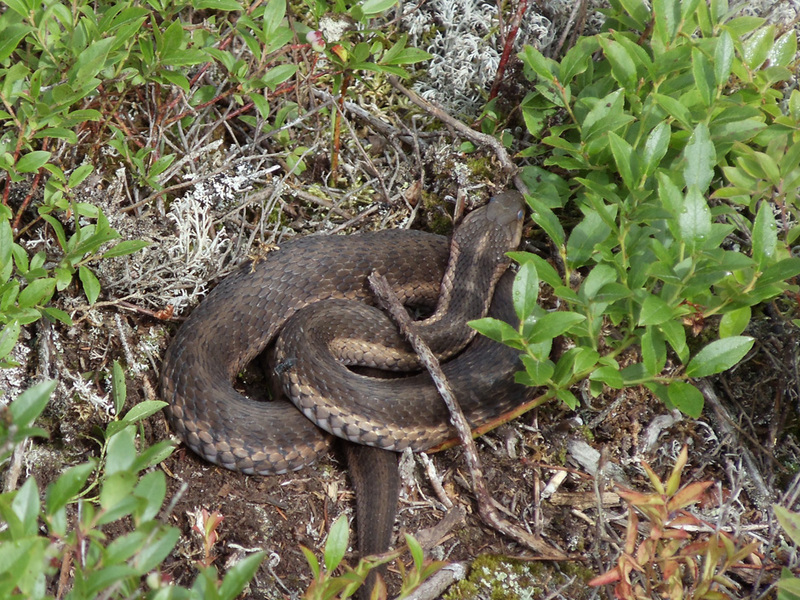 Click on any thumbnail image below for a photo slideshow of the Maine Appalachian Trail.